Tengawa at Millenia Walk boasts to be the first in Singapore to serve Japanese white curry, using Hokkaido milk. 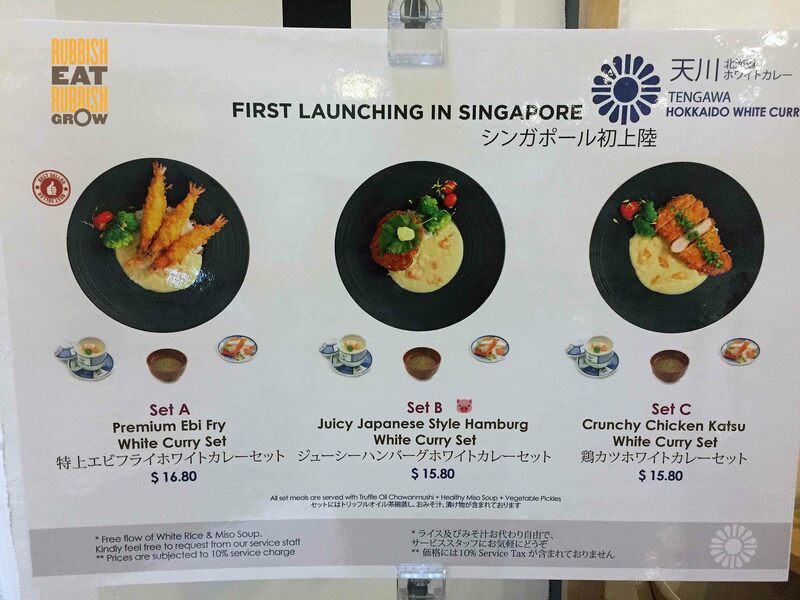 It is a no-frills, no-reservations, casual restaurant with a focused menu of only three sets: ebi fry (prawns, $16.80), hamburg (beef patty, $15.80), and chicken katsu ($15.80). This is good news for Pisces, the most indecisive of all Zodiac signs. Each set comes with miso soup, and truffle chawanmushi (steamed egg). Bottles of pickles sit at every table. You may request for more miso soup and rice. The chawanmushi comes with a prawn on top and a bit of (chicken?) meat at the bottom. At this price point, I shouldn’t complain… but I’d prefer them to cut the cost of the truffle oil, remove the truffle oil completely, improve the egg-to-stock ratio, and make it more “eggy.” Now it tastes more chicken stock than egg. The white curry is sweet and creamy and viscous. There is a peculiar but almost imperceptible musky aftertaste which I am willing to put it down to adding to the complexity. But my problem is that curry, even Japanese curry, is supposed to be fragrant with spices. When I visited Tokyo and had their curry, it was mildly spicy. But Tengawa’s white curry has no fragrance of spices nor is it spicy. Both the prawns and the chicken katsu are excellently done: very crispy without a drop of oil. Of the two, I prefer the prawns because the flesh is sweet and firm and fresh. But the chicken katsu is good too, tender and not dry. -the curry is not enough for the rice. More curry, please! -Japanese rice must be sticky but not lumpy. But here, the rice is lumpy, and as a result, it doesn’t absorb the curry. -the restaurant is beside a passageway and our eye level is where the passersby’s shoes are. Mr Fitness said, “Not bad! We can see other people’s shoes and observe the fashion.” But my concern is passersby are walking, kicking up dust into the food. Tengawa needs to install a glass pane to separate the corridor and the restaurant. As a whole, the experience is pleasant. The food is better than average; the pricing is reasonable (we paid $38 for two persons); the service is friendly and the servers were full of smiles. A male server, who may have mild OCD, rotated the plates when he placed them down, so that the plates were at the exact angle he wanted, so that we as patrons could view the food at an optimal angle. I find his action endearing. We would return to Tengawa if we happen to be nearby, and we recommend it. –Sushi Murasaki, Millenia Walk: The ULTIMATE Beef Donburi (With Almost EVERYTHING in It) and Legendary WATER CAKE!! !